Did the National Democratic Alliance nominate A P J Abdul Kalam as its candidate for the Presidency because of his achievements at the Indian Space Research Organisation and the Defence Development Research Organisation or because the NDA government wanted to soothe Muslim sentiments after the anti-Muslim riots in Gujarat? And what is one to make of Kalam's eclectic beliefs? rediff.com spoke to Muslims to find out what they think of Kalam's nomination. The concluding part of a random survey of the Muslim community's views on the matter. Shafi-ur-Rahman, 60, petty trader selling books on a wooden cart in Okhla, Delhi: I look at Abdul Kalam's candidature as a policy decision by the National Democratic Alliance government. They are looking at their benefit. I think it has been prompted by the state of affairs prevailing in the country. After the Gujarat carnage, Indian Muslims have been anxious about their security. The government seems to believe that by making Kalam the President, it would placate the Muslims. I do not know much about him. They say he is a great scientist and made the atomic bomb. I saw and heard him recently on television. But I do not see Kalam's Presidency changing anything for Indian Muslims. In fact, it is nothing unique or startling. We have had Muslim Presidents earlier. Zakir Hussain and Fakhruddin Ali Ahmad were there. They had to follow government policies. Who looks at commoners? Mohammed Shoaib Siddique, 26, embroiderer in Zakir Nagar, (named after former President Zakir Hussain), Delhi: It is a good feeling to see a Muslim make it that big. I have heard that Kalamsahib does not offer namaz or read the Koran. But still he will be a voice for the Muslims. If something horrible happens to the community, at least he would take a stand. Despite his being a non-practicing Muslim, he would not be blind to the suffering of his community. Shikhoh Hyder, 23, studies social work at Jamia Millia Islamia, New Delhi: It is a great move to have a person with a secular bent of mind like A P J Abdul Kalam as the country's President. However, if Muslims expect him to help them and change their lot, they would be disappointed. We have had Muslims Presidents before; the Presidency is actually a powerless job. Kalam can hardly do anything for Muslims. But looking at it as a Muslim, I feel proud. Kalam has made a name for himself as a scientist and his contributions to the country are incomparable. Naseem Qureshi, former lecturer in Hindi at Jamia Millia Islamia, lives in Jamia Nagar, the university campus: There cannot be a second thought about Kalam 's towering personality. But it is unfortunate that the President's post is being politicized. Kalam is being reduced to 'They are getting a Muslim President' No post should be given or taken on the basis of a person's religion. It will weaken both the Muslim community and Kalam himself. I believe it would have been better had Kalam stuck to his research. It is unfortunate that he went on television saying that he has never offered namaz or read the Muslim texts. What does he want to prove by highlighting the fact that he is non-religious? I do not buy that he will be the voice of Muslims. The Indian Muslims are not rallying behind any Muslim leader now. For no Muslim leader has done anything for them. Shabeen Hussain, 24, social worker, Delhi: It is a good gesture to have a non-political figure as President. The political scenario of the country is so degraded that it is a relief to have a person like him there. But it is ironic that while refugees in the Gujarat camps do not have enough food and medicine, Indian Muslims are aspiring for decorative positions. As an individual, Kalam's contribution to the defense sector is amazing. 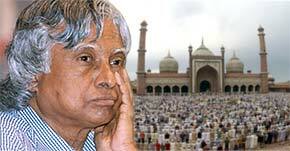 The criticism that Kalam is not religious is not an issue. Whether he reads the Koran or the Gita, it is for him to choose. Practicing or not practicing one's faith is a personal issue. It should not be dragged into public. Hanif, 40, a knife sharpener, who has been practicing his trade for 25 years in Kidderpore, Kolkata: Yeah, I have heard of him. He was a freedom fighter -- Maulana Abul Kalam Azad. [When told that A P J Abdul Kalam is a different person]: This is the gameplan of the BJP. They are fooling the Muslims of this country. It does not make much of a difference to us. Safiullah, a rickshaw puller for the past 15 years, Grand Street, Kolkata: He is the one who has made the bomb to destroy Pakistan! He will make a good President as he is very knowledgeable, but he should not get carried away by the BJP plans. He should do something for the poor Muslims of the country and stop the killings in Gujarat. Amranul Haque, owner of a small hotel on Lenin Sarani, Kolkata: I have heard from a customer that Abdul Kalam prays to Hanuman [a Hindu god] for success at work. Abdul Kalam is a man of the BJP and is brought in just to fool the Muslims of the country. If, after Gujarat, any Muslim is with the BJP, he will go to hell. If Abdul Kalam were a true Muslim, he would not have accepted the BJP's offer and would have continued with his good work as before, away from the power game. Now it remains to be seen if this man can really safeguard the cases of the Muslims and other minorities of the country.